As you know by now, a very dedicated group of parishioners recently formed the “rectory committee” with the intention of assessing, inventorying, and cleaning up the rectory building on the St. Francis de Sales campus. This group has been appointed by Fr. Mark to make recommendations to the parish for the future use of this historic structure. Built in 1902, it has been used for over 100 years as the home of past parish priests. Our associate pastor, Fr. Sergio, is the current resident. One of the areas that needed immediate attention was the basement. There was a lot of discarded junk down there (an old water heater etc.) and it was damp and musty. It was evident that mice were getting in and that is being remedied. Recently some of our Knights of Columbus (and their wives!) did a major clean out and it looks amazing! During all of this it was discovered that there was a locked safe down there as well. Did this lady put her ring in the offertory basket anonymously? Perhaps it was a ring from an engagement that never ended up in marriage? Or maybe it was a gift to her? 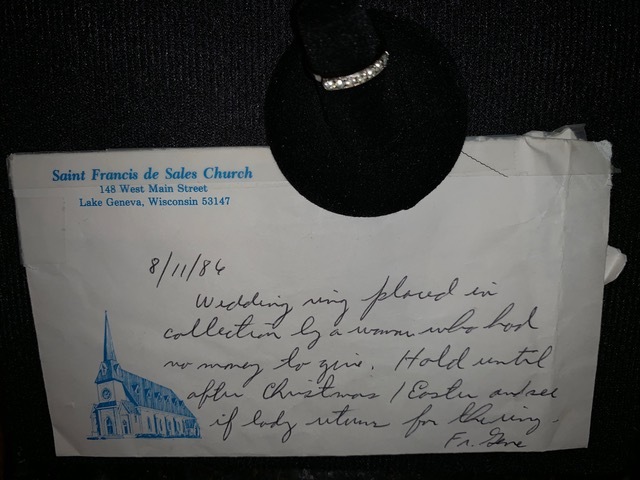 We’ll probably never know the answers, but it’s very touching that she would give one of her most valued possessions to the church! We had the ring appraised and it turns out it is costume jewelry and has no monetary value. But the historic value? Priceless! The ring, note, and bonds will be on display this weekend at the rectory open house. There will be hospitality after every Mass (October 6,7) and you are invited to come and take a guided tour of the rectory to see it for yourself. Thank you, Fr. Sergio, for opening your home for this very special occasion!